1. Slice red onions into thin strips. 2. 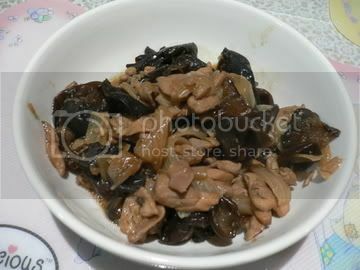 Soak black fungus in water for 20mins or until soft. Remove "stem" & cut into smaller pieces. 3. Mix chicken with oyster sauce, soy sauce & sugar in a bowl. 4. Heat 1tbsp extra virgin olive oil in pot stir fry ginger slices and onions till fragrant. 5. Add in chicken and fry till cooked. 6. When ready, add in water & let it boil till water level lowers down. 7. Pour in black vinegar, mix well and lastly, add in cornstarch to thicken the mixture.